Heavy Duty Polypropylene Twine, 215# Tensile, 5500 ft. 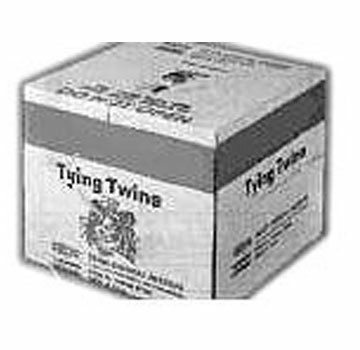 PRODUCT: #550 SIZE HEAVY DUTY 1-PLY POLYPROPYLENE TYING /WRAPPING TWINE, 210 LB TENSILE, INDUSTRIAL QUALITY, WHITE COLOR, PACKAGED IN 12x12" SQUARE CENTER-DRAW DISPENSING BOX. 5500 FT/BOX. PRICE/BOX. APPLICATIONS: Multi-purpose twisted twine for industrial and commercial applications. High quality twisted twine of white polypropylene fiber, designed to provide strength together with excellent handling qualities. These soft, uniform twines with their superior knot holding capabilities are ideal for a wide range of applications. Tensile strength is ~ 210 lbs. Resists rot, abrasion, oil, and grease. Handles and ties very well.